What does rabbit hole mean? Used especially in the phrase going down the rabbit hole or falling down the rabbit hole, a rabbit hole is a metaphor for something that transports someone into a wonderfully (or troublingly) surreal state or situation. On the internet, a rabbit hole frequently refers to an extremely engrossing and time-consuming topic. Where does rabbit hole come from? 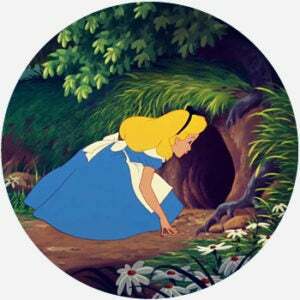 Literally, a rabbit hole is what the animal digs for its home. The earliest written record of the phrase dates back to the 17th century. But the figurative rabbit hole begins with Lewis Carroll’s 1865 classic, Alice’s Adventures in Wonderland. In its opening chapter, “Down the Rabbit-Hole,” Alice follows the White Rabbit into his burrow, which transports her to the strange, surreal, and nonsensical world of Wonderland. Since then, Carroll’s rabbit hole has proved a popular and useful reference. The Oxford English Dictionary finds the first allusive rabbit hole in a 1938 edition of The Yale Law Journal: “It is the Rabbit-Hole down which we fell into the Law, and to him who has gone down it, no queer performance is strange.” Over much of the 20th century, rabbit hole has been used to characterize bizarre and irrational experiences. It’s especially used to reference magical, challenging, and even dangerous places or positions, similar to Carroll’s topsy-turvy Wonderland. Rabbit hole has many metaphorical applications—from frustrating red tape to the mind-bending complexity of science to hallucinations during altered states—all united by a common sense of passing into some labyrinthine, logic-defying realm that, once entered, is hard to get out of. One can fall down the rabbit hole of government bureaucracy, healthcare, obtaining a green card, tax law, the political economy of modern Japan, puberty, college admissions, or quantum mechanics. If you’re Neo in the hit film The Matrix, you can take the red pill—a pill that shows you the truth, as opposed to the blue pill, which keeps you in ignorance—and “see how deep the rabbit hole goes.” In a related note, some people literally take pills and go down the rabbit hole of a psychedelic drug trip. Thanks to the abundance, variety, and instant access of content online, many fall down internet rabbit holes which are often spectacularly, and addictively, niche: scary stories, obscure conspiracy theories, or famous last meals, for instance. From formal documents to internet status updates, rabbit hole is a very popular and widespread expression. Unlike earlier iterations of the metaphor, internet rabbit holes convey less a sense of weirdness, disorientation, or difficulty than they do of an intensely captivating diversion. Rabbit hole is also showing increasing use as a modifier, e.g. a rabbit-hole question or phenomenon.